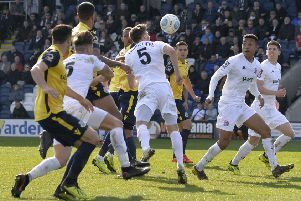 Facing an Eastleigh side who could have overtaken them with victory, the Coasters slipped to an early two-goal deficit at Mill Farm. Dan Bradley pulled one back but it could have been worse for Challinor’s players – only for Jay Lynch to make amends for conceding a penalty by saving the resulting spot-kick. Fylde capitalised on Lynch’s heroics as second-half goals from Jordan Tunnicliffe, Nick Haughton and Alex Reid sealed the 4-2 win. “It was a massive, massive win and I think we showed huge amounts of character today and a fully deserved three points,” said Challinor. “I wanted us to play on the front foot with an urgency, but there’s a difference between urgency and panicking, which is what we did, and the penalty summed it up. “But, the second half, we were fantastic, and the manner of the goals were very pleasing.